Trying to market your product without knowing whom you should market to is like walking blindfolded. You might still end up in the right place. But it’s not very likely. A new startup might try anything to get its first customers. At this exploration stage, you cast the net wide. You approach different individuals and companies and do whatever it takes. Any customer is a great customer. But as the company grows, it learns that not all customers are created equal. Some are easier to acquire. Others benefit more from the product and are easier to retain. Yet others are easier to expand and upsell to. This raises a question. How do you know who is your primary target audience? At an early stage, you “just know” your ideal customer. Your ideal customer profile is whoever was willing to buy your first product or sign an agreement before you even developed a prototype. Of course, you can always stop here. But if you’re planning to become a world-class company, you might need to take it to another level and make sure that your marketing is also world-class. All top technology–, and more narrowly, Software as a Service (SaaS) companies have a very clear understanding of their ideal customer profile. Even though this post will be particularly relevant to this type of companies, the general principles can be applied to any industries. A side-note on terminology: terms such as “ideal customer profile” and “target audience” are often used interchangeably. “Buyer Persona” is another similar term that emphasizes the focus on individuals – as opposed to companies. An ideal customer is a customer that is more likely to like your product and pay for it. Knowing your ICP should help you grow revenue while investing less. 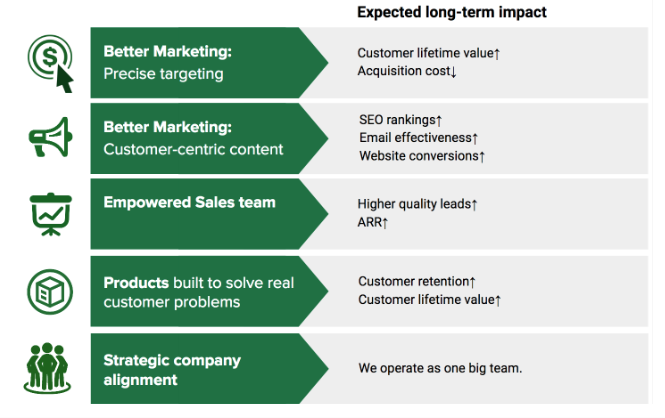 This higher return on investment is achieved through better targeting among other things. Imagine, you sell software that helps cities analyze traffic patterns and make better urban planning decisions. You could place a TV commercial and hope that the right people will see it. This would be utterly inefficient. Alternatively, you could identify a subset of cities that are most likely to adopt this type of software, then identify the right officials who are most likely to be decision makers and target them with a proposal that addresses their specific pains and explains how your product can alleviate them. Needless to say, this would be infinitely more effective. And, by the way, customers will also appreciate this targeted approach. See “Principles of Ethical Marketing” for more on this. You can find an example below that you can use a starting place and tailor it to the needs of your company if needed. What group of individuals should we target and why? How to target them most effectively? Here is another graphic that illustrates the types of insights you might want to obtain: Let’s get more specific. What do you need to know about companies and individuals to decide whether you want to target them and to do it effectively? Let’s start with the end in mind. The final result should be very easy to understand. Creating a visually-appealing design for communication purposes is a good idea! If you’d like, you can request a free copy of this ICP template in Google Slides or pptx format. So, what you need to decide is what companies and personas to target and how to do it? Let’s start with companies. 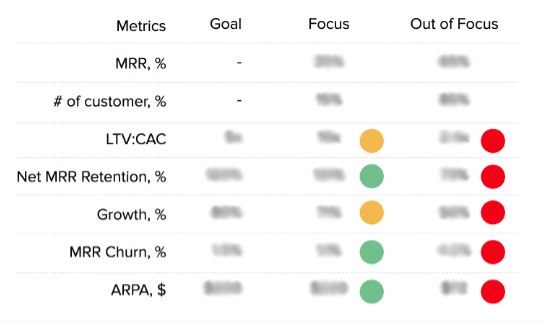 First, you might want to decide what metrics you care most about. Second, you can identify attributes that can help you in the future. Third, you might want to correlate these attributes with metrics of interest to find your sweet spot. Priority 1. Tech companies in the US, size 50-200. Average LTV: $8456. Priority 2. Manufacturing and construction companies in the US, size 100-500. Average LTV: $7863. Priority 3. Marketing agencies in the US and EMEA, size 20-100. Average LTV: $3753. A side-note: to learn more about key business metrics commonly used at technology companies, read this blog post. 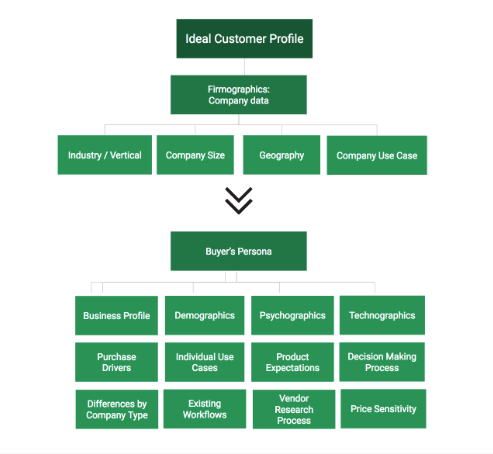 Now, let’s talk about buyer personas. First, understand who is most likely to benefit from your product. Who is most likely to use it? Who is most likely to champion it within an organization? Who is most likely to pay for it? Second, figure out the key distinguishing characteristics of these personas. Often these characteristics are titles. But sometimes these characteristics can be demographic, behavioral or technographic. Third, you need to get into these people’s head. Above-mentioned demographics, psychographics, and technographics. Day-to-day work: goals and KPIs, challenges and pains, cross-functional collaboration, existing workflows, and use cases, etc. Everything about the problem you’re trying to solve: how prevalent it is, current solutions, what works about current solutions, what doesn’t work, what they wished worked better, and “whys” behind all those answers. How vendor choices are made: what triggers a decision, who makes it, what’s taken into account, as well as price sensitivity and the vetting process. Deep-dive into solutions: what competitors customers know about, what business benefits they expect, what features they care about, what other considerations they have in mind; “whys” behind all these. Media preferences: video vs. text; blogs vs. email; LinkedIn groups vs Facebook groups, etc. * This is arguably the most important source of information – watch this lecture by the Twitch.tv founder at the YC Startup School at Stanford to learn why. If a customer says “we just want something that integrates with our CRM”, you can ask “why?” and hear “because we need to get started quickly”. Then, you ask “why?” again and hear “because there is a high turnover on the team and we have no bandwidth to learn new tools”. Now, you know the pain. After you are done with interviews, you can use quantitative analysis to validate hypotheses generated during interviews. For example, you can look into your product usage data to see how many customers actually enabled a CRM integration. Or you can survey the broad customer base to see if the problems uncovered during the interviews are universal and shared by many customers. Now, you have hard data. A side-note: you might choose to partner with a research agency if resources permit and/or if you lack in-house expertise. This partnership can be particularly useful when it comes to interviews. There are agencies that specialize in qualitative research and have professional interviewers who can help you get the insights you need. Make sure that you get inputs and feedback from all key stakeholders. Usually, these include the Executive team, other Marketing teams, Sales, Customer Success, Product, and Finance. 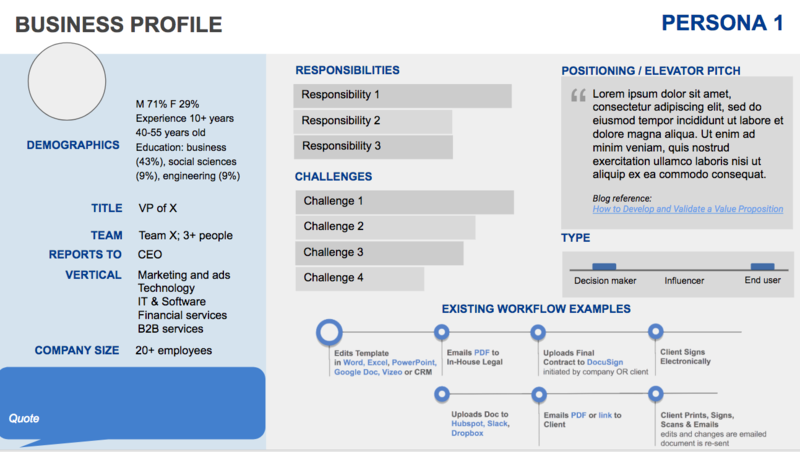 Finalize the company profiles and buyer personas, decide what insights are most important and need to be used and communicated. Update value proposition and write positioning statements, tailored to each persona, to appeal to their specific pains and purchase drivers. Work with the design team to create visually-appealing profiles that can be printed out, hang on the walls and included in the onboarding materials. Communicate to key teams or to the entire company. Implement all the learnings. Marketing: better targeting and content. Product: better product decisions. Sales: better demos. Continue updating your understanding of ICP as the company, products, and the market evolve.